Before I start, I want to point out that this is not a post, that in any shape of form, is intended to knock Ikea or it's products, or any other furniture shop for that matter. I was just staggered when I read an article in the papers about the amount of resources that are used in the production of new furniture and I wanted to write a post about it. I'm sure we have all, at some point, visited an Ikea store. I know when I lived in London it was quite a regular occurrence and like most people that visit Ikea I was also guilty of coming away with a whole load of stuff that I didn't really need but seemed like a good idea at the time....... they are very sneaky at marketing and product placement in Ikea. Launched in 1943, the Swedish business has grown to become the world's biggest furniture company and according to an article in The Guardian, in the last financial year, 655 million people flocked to its stores, of which it currently owns 298 in 26 countries. Quite an amazing fact but, the most startling fact of all is that last year it used 13.56 million cubic metres of solid wood and wood-based board materials, not including paper and packaging, which amounted to almost 1% of all wood used commercially in the world. Staggering!! Although Ikea are now attempting to increase their existing sustainability policy, it still got me thinking. Anyway I thought I would post a couple of picture of my junk shop finds. Firstly, here is our old piano. No one actually plays it but it would cost an arm and a leg to get someone to come and take it away and it's handy to display photographs and things on. It was so horrible and scratched that it looked awful so I decided that a coat of paint would be just the trick so, I painted it pink. This useful little table was given to me by a friend who was moving to Spain and was having a clear out. 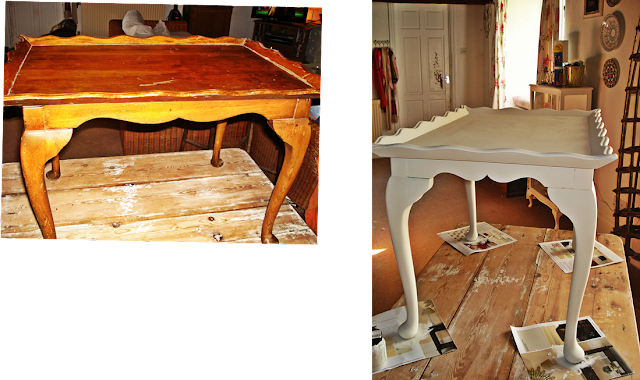 A coat of Chalk Paint and it was transformed. 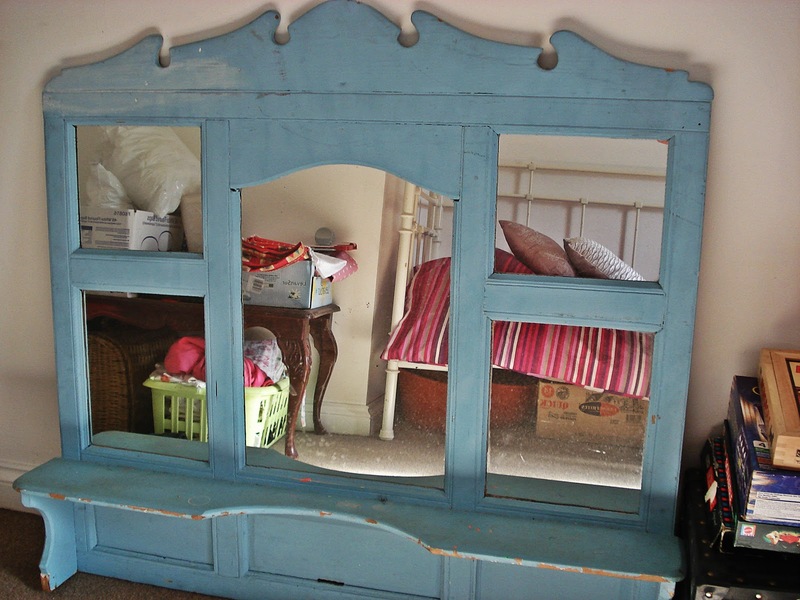 This gorgeous over mantle mirror was bought for £10 from an online auction site and was chipped and tatty with weird splodges of bright orange paint. A quick coat of chalk paint and it looked fabulous hung over the fireplace. I really enjoy doing these mini makeovers and I was talking about my junk-buying obsession with one of my friends from the market. She suggested that I do a few small pieces and take them to the market to sell. I'm seriously thinking about it. Not only will it bring a few extra pounds into the kitty but if people buy upcycled, repurposed, preloved items, it's one less tree that needs chopping down and I'm all for that! If you love recycling things too, there is a fabulous blog called fleachic here that has the most amazing transformations. I absolutely love this blog and it has given me loads of ideas for transforming things I have bought. A girl after my own heart! Love your makeovers, and I like you, love to give something a new lease of life so that it gets a good few more years, rather than being sent to landfill. Do you know I don't thing I own anything from Ikea, I much prefer older pieces. I love your makeovers too.I have discovered the joys of making over old furniture. My home has a mix of both new and old.It feels so good to 'rescue' something old and unloved and give it a new lease of life doesnt it? 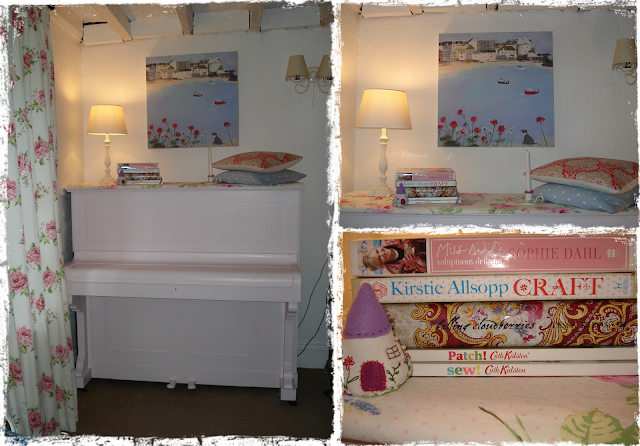 Apart from the mattresses on the beds and the white goods just about everything in the cottage is old and recycled. I do have some massive wardrobes that were flat packs but they were gifted.